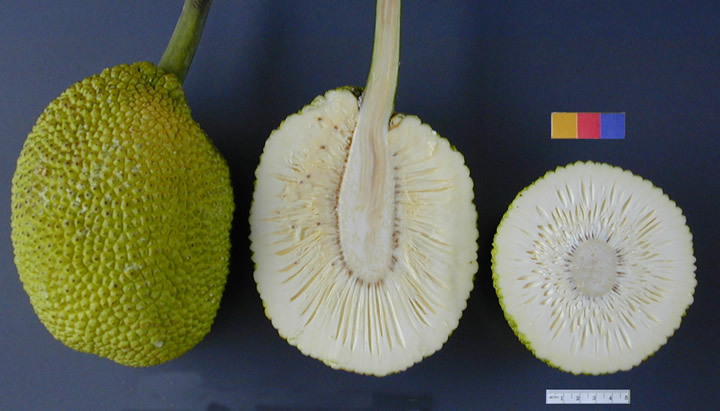 Breadfruit is the name for an evergreen tree in the mulberry family. Originally, the tree grew in Southeast Asia. It has been cultivated and is grown in the tropical and subtropical regions of Asia, Central and South America and the Caribbean. The tree can reach a height of up to 20 metres (66 ft). The breadfruit is the fruit of this tree. The fruits contain a lot of starch - much like potatoes; they are ground to make flour, which can then be used for baking. Ancestors of the Polynesians found the trees growing in the northwest New Guinea area around 3,500 years ago. They gave up the rice cultivation they had brought with them from Taiwan, and raised breadfruit instead. They took the trees with them wherever they went in the Pacific. The exceptions were Easter Island and New Zealand: both places were too cold to grow the trees. Their ancient eastern Indonesian cousins spread the plant west and north through insular and coastal Southeast Asia. In historical times, it has also been widely planted in tropical regions elsewhere. 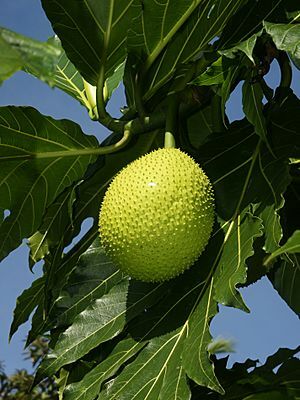 The Mutiny on the Bounty was caused by breadfruit trees: In 1787, William Bligh was ordered to load a number of these trees on Tahiti and to ship them to the Caribbean; there they would serve as a cheap food for the slaves working on plantations. The main plantations at the time were those of sugarcane. This was the first attempt a government made to grow an economically important plant at a different location. The attempt failed, because the seamen did not understand why the drinking water supply was used to water the plants; they threw the plants overboard. 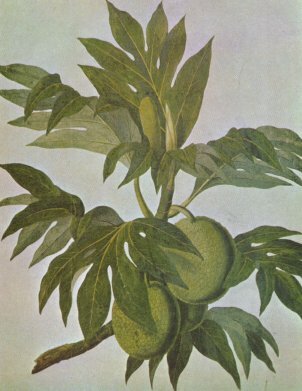 Bligh was able to ship the trees in a second voyage: Arriving in the Caribbean, he faced a different problem: The slaves there did not accept breadfruit as a replacement for cereals. Bligh won the Royal Society medal for his efforts, even though the introduction was not entirely successful. Although most slaves refused to eat the new food, breadfruit was accepted into the cuisine of Puerto Rico. Breadfruit Facts for Kids. Kiddle Encyclopedia.